These stylish A1 Photo Frames are supplied by KENRO who have supplied the Photography Trade since 1973. All A1 Photo Frames are fully assembled with backs, glazing & Hanging hooks. All Frames can be mounted in a landscape or Portrait Orientation (Horizontally or Vertically). Kenro frames are excellent quality and will last a lifetime. 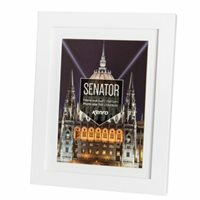 A1 / 59.4x84.1cm Senator White Hand Crafted Wood Picture Frame with 50x70cm Removable Mount. Matt Finish. Flat Profile: 20mm wide x 30mm deep.